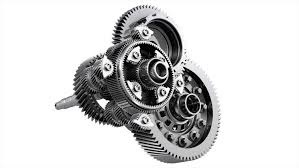 The planetary gear set functions by altering the ratio of input to output gear speeds through engagement of one of the gears to another, offering a range of available ratios depending on which is engaged to which. But rather than being controlled by a shift lever, a complex system of hydraulics control which set of planetary gears are engaged at a given time. This hydraulic control system is in turn controlled by an electronic control unit programmed to suit the engine and vehicle the automatic transmission is installed in. It’s impossible to say exactly what your car will sound like when there is trouble with your planetary gear, but one thing's for sure, you’ll get a “I haven’t heard that sound before” feeling when you notice it after accelerating and then letting off the gas pedal. The sounds that are produced vary widely between different makes and models, but the best way to describe them is that you’ll probably hear a growling or whining noise. Front wheel and rear wheel drive vehicles will emit sounds that can be described as being slightly more mechanical and the sounds will be determined by its location. A growling sound when you accelerate to 30mph and shift neutral almost always lies within a planetary gears, while constant velocity increases the source if the growling dissipates.